When you first practice hand lettering, it can seem daunting with so many styles and characters to learn. But the easiest way to get a feel for any new subject is to start with the basics. After all, you have to know the rules before you can break them. There are a lot of nuances in type that you wouldn’t usually think about because most people don’t stare at the letters themselves—they just read words. They’re not paying attention to how the letters are shaped and why. Just finished the first concept for a wedding invitation commission live on Twitch this morning. Tune in tomorrow at 2 pm PST for round two at twitch.tv/lettershoppe. This post is here to help jumpstart your hand-lettering education with 5 tips you probably don’t know. For most lettering noobs, drawing smooth lines is a challenge. So do yourself a favor and always do some hand exercises to warm up your drawing muscles. Just like doing a warmup before a workout, you need to wake up the muscles in your hands. These exercises will not only strengthen your hands, they’ll help prevent osteoporosis. Hand and finger exercises increase strength and range of motion, and they relieve pain. Stretch only until you feel tightness—don’t hurt yourself. This exercise helps increase the range of motion in your thumbs, which helps with picking up pens and keeping them steady as your draw. This stretch helps improve the range of motion in your fingers, and it’s also great for better hand-eye coordination. Bend your fingertips down to touch the base of each finger joint. Your hand should look a little like a claw. Stretching out lettering is a mistake I see a ton of beginners make—especially when they bring their designs into Photoshop to tweak. You can’t just stretch out your letters for better spacing —you have to redraw them so that the thin and thicks of your letters stay consistent with one another. See how the middle W is much thicker than the first? This weight inconsistency is what happens when you just stretch out your letters. It’s important that all the letters of a word match up, especially when it comes to thickness. If you need to stretch a letter in Photoshop for better spacing, please print out your drawing and take the time to redraw it. This is something I usually do a few times to help get my letters in tip-top shape. If you do re-sketch your letters, it won’t be the end of the world. But people will notice something is wrong with your piece even if they can’t put their finger on why. Any letter that has a bowl or rounded curve needs special attention when aligning with the rest of your letters. Letters like O, Q, C, G, S, and U must be a tad above and below the baseline for them to appear to be resting on the same plain. No matter how thick or thin your letters, your stems (vertical lines) should always be thicker than your crossbars (horizontal lines). This helps the letter appear balanced and not toppling off. I draw out the above compass to help me remember which lines are thick and thin. Your horizontal and upper diagonal lines should always be thin, and your vertical and bottom diagonal should be thicker. Even when you’re designing mono-width lettering (where all the letters are supposed to appear to be the same weight), this same rule applies—it’s just less dramatic. Here’s a mistake I see a lot of new letterers make when it comes to adding thickness in the right places for letters like N, M, and W.
The diagonal stroke of an N should be thicker, not the outside lines (since they both go up). Alternate strokes of a W and M are thick. The great thing about lettering is that it takes layers to create a smooth, finished piece. So don’t expect to get an award-worthy piece on the first try—be prepared to use a ton of paper. I always start super small with thumbnails and work my way up to a finalized sketch by redrawing my work at least 5 times. 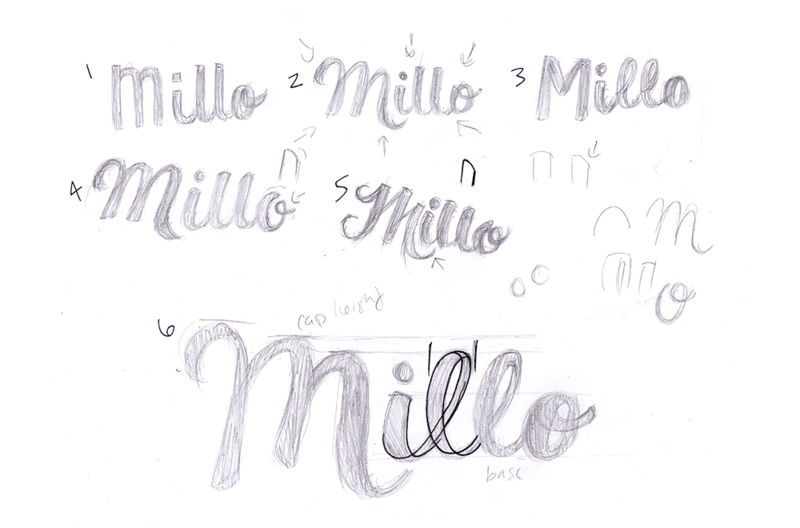 Just check out these recent thumbnails I created for the Millo custom logo design I worked on. Sometimes I even scan in my work and put it into Photoshop to tweak and resize my letters according to a grid to then print out and redraw from there. I also find it helpful to write down some notes directly on top of my lettering to make sure I don’t leave anything out when I redraw it. 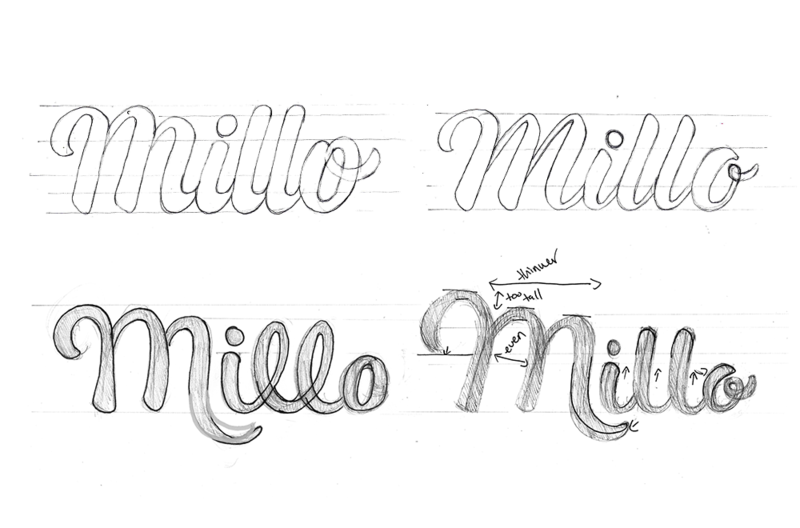 Want to try creating a hand-lettered logo design? I’ve written all about that in this InVision Blog post—check it out! This was originally posted on Letter Shoppe. Dina Rodriguez is a freelance hand-lettering artist in Portland, OR. She blogs on topics of creativity, freelance, and hand lettering on her blog and sells handmade posters featuring her work. You can stay in touch with Dina by following her on Twitter for the latest updates, or on Twitch to watch her letter live.